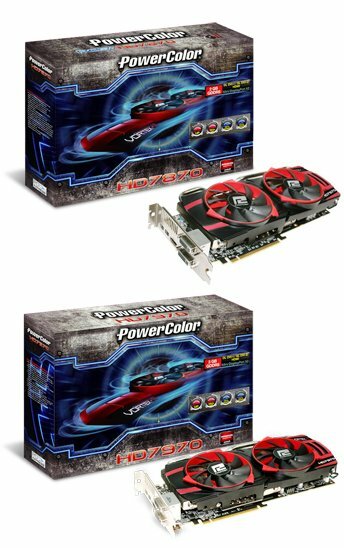 PowerColor introduces the PCS+ HD7970 Vortex II and the PCS+ HD7870 Vortex II, two new cards with the company's Vortex II cooler. The Radeon HD 7970 model has a 1100MHz core and 3GB GDDR5 clocked at 5700MHz, while the 7870 has a 1120MHz core and 2GB GDDR5 clocked at 5000MHz. Both cards have DL-DVI-I+ SL DVI-D + HDMI+2x mini DisplayPort outputs. TUL Corporation, a leading manufacturer of AMD graphic cards, today announced a gaming graphics series designed for enthusiasts only: the PowerColor PCS+ Vortex II series. The latest patent cooling series released with HD7970 and HD7870; by taking advantage of the deluxe “Platinum Power Kit” design, allowing the best power efficiency and enhancing stability at overclocking mode. The latest series armed with patent “Vortex” II cooling technology, featuring an adjustable and perforated fan design, gamers can manually adjust the fan and its physical attribute, optimizing the air flow and dissipating the excessive heat efficiently, providing no-compromise cooling effect with silent gaming environment. The PCS+ HD7970 Vortex II clocks at 1.1GHz core speed, while memory speed at 5.7Gbps, enabling the maximum settings for demanding titles. The PCS+ HD7870 Vortex II has 1.12 GHz core speed and 5.0 Gbps memory speed, delivering the astonishing and breathtaking gaming experience to the enthusiasts. Engineered with support for all the latest technology, the latest Vortex II series is well prepared for the next generation of gaming; by utilizing AMD Eyefinity 2.0 technology and AMD HD3D Technology, it supports multi-display stereoscopic 3Dcontent, allowing an immersive “wrap around” gaming experience. Also, it packed with AMD PowerTune technology, enabling the intelligent power monitoring to enable higher clock speeds and better performance when needed, delivering the most efficient way for gaming like never before.